A relatively small side table or nightstand was required for light storage and I wanted something in solid wood. Part of me wanted the MALM 2-drawer chest, but it felt too bedroom-y for use anywhere away from a bed. The TARVA was supposedly solid wood and it looked versatile enough to be used anywhere in the house. The TARVA nighstand's plain cardboard box didn't look like a big deal from the outside still sealed. I thought I was in for a treat and that I would be done within an hour. Then I opened the flip-up lid and found a lot of parts, densely packed inside with few pockets of air. Part by part, everything came out, and it looked like I was watching clowns come out of a tiny car. Laying out all the parts took up a lot of floor space. Inspecting the bags of screws and other hardware, and the instructions really started to worry me. What I didn't initially do was pour out and sort all the screws and bits because it seemed like a lot of work. Once I got started on the side panels and couldn't find anything, I spent a good ten minutes doing just that. 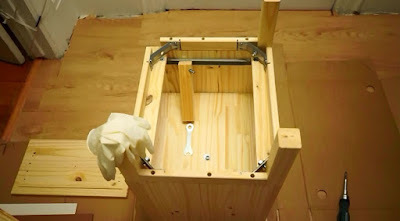 There were a lot of wood dowels and those two part screw-lock things -- a metal dowel that screws in on one side but is locked in place using a cylindrical piece on the other side. For some reason, the screw-lock things usually say "difficult job ahead" to me. It took around two hours, probably more, to put the TARVA nightstand together. I started with the side panels, mounted other panels, the feet, and finally the drawer. The biggest mistake I made was with the legs: they screwed into metal supports that I initially screwed in my tapping my own holes. Problem was that there were pre-drilled holes that I had to move the plates a few millimeters to see. Luckily, I found that out after the first of four plates and only doubled the number of holes on one side. There was also another issue with nailing in the rear panel behind the drawer. I hate using a hammer and nails, so there's that, but what happened was I destroyed a few nails. They weren't going in along the lower edge and when I gave it a big swing, they just folded. My guess is that I was placing the nail right above screws, dowels, or other hardware. I didn't notice an anti-toppling or wall-mount device included with my Ikea TARVA nightstand package. The stand didn't seem like it would tip over with a light nudge or with a gentle breeze, but with the drawer pulled all the way out, it didn't seem like the nightstand was impossible to tip over. Get more solid wood, especially pine, items? I recently got an Ikea FJELLSE bed and the two look like they would make a great pair. 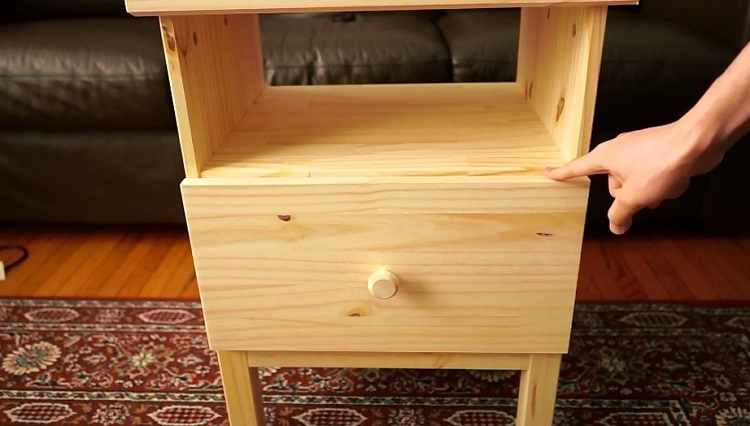 It's a nightstand with a single drawer. I didn't expect it to do much other than not fall apart and have a working drawer. So far, it has accomplished both. There was some slight worrying when I put the drawer in and it didn't line up properly -- turned out that a screw wasn't tightened enough for one rail. Once that was solved, I was pretty impressed with the size of the single drawer and how smoothly it operated. The rails for this TARVA's drawers appeared to have two wheels on each side that helped sliding in and out. 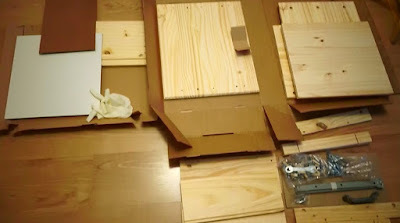 In comparison, I don't recall what my older Ikea KULLEN used for rails but I hated the sound it made when operating the drawers from day one -- sounded like there was a lot of friction. As a whole, the TARVA nightstand looked very attractive to me. Everything usually visible (i.e. not the bottom or rear) appeared uniform and well finished. There were some surface blemishes but nothing that caught my attention too much. The overall size was adequate for my uses and I had more than enough space to put what I wanted on the surface or in the compartments underneath. Things that would have been amazing: solid wood drawer bottom and rear panel. They wouldn't really be visible during regular usage, and there would probably be cost and weight savings using fiberboard (according to Ikea.ca website). However, you've come so far, why not finish it off? Most of the product was solid wood and it really would have been nice to have those parts be solid wood too, even if the price were higher. And did I mention that I hate nailing backings onto furniture? At CA$ 59.99, it seemed like a reasonably priced piece of solid wood furniture. I would have been even happier if the price were more in line with the American price though. Assembly was on the less than easy side for me. The process wasn't perfectly smooth. A few other things could have been different. However, I liked the finished product a lot.